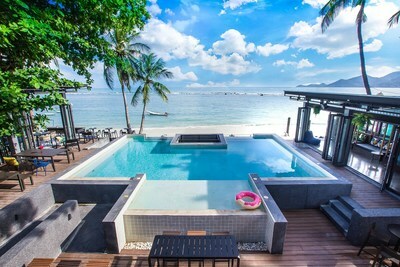 SURAT THANI, Thailand, Jan. 22, 2019 /PRNewswire/ -- Lub d now provides visitors to Samui Island with its distinctive "social hotel" concept after the successful operation in popular locations in Thailand at Bangkok and Phuket. Lub d Koh Samui Chaweng Beach stands directly on Chaweng Beach and right in the middle of the island's most happening global traveler scene in Surat Thani province. Yet at the same time, guests enjoy ample grounds in a natural setting with breaking waves only steps away. What's a social hotel? It's where socializing and making new friends aren't happy coincidences but all part of the plan. Exemplifying the concept is Tropics Beach Club, the hotel's seaside community hub for sunning, swimming, dining, poolside parties with DJ tunes, fun games, special events and more. And that makes Lub d Koh Samui Chaweng Beach something genuinely different: a place for comfortable yet affordable rooms in an all-in-one beach club setting. It's Chaweng's top new spot for having fun, relaxing and sleeping well -- and it hits the price/location/quality sweet spot straight on. Chief Operating Officer for Lub d Group, Simon Morley, adds: "Lub d gives experience-driven travelers something not easy to find -- affordable accommodation that's built and fitted to high standards along with amenities rarely associated with such affordability," he adds. "Our hotels' social spaces likewise set us apart and include gathering points for many kinds of fun activities, in addition to green spaces for quiet relaxation." Visit https://www.lubd.com/samui/. For bookings, please call: +66 (0) 2-635-7373 or email: Sales@lubd.com.